It just for some reason she never decided to give a selfish buff as soon as she can (instead waiting until being near the Tower... Chaotic Goddesses act in strange ways). It just wouldn't be flashy enough, especially for Ultimate's standards. And class changes would probably just be outfits if anything. So I stand by the Sothe team-up, or for a more darkly humourous version, trap the opponent(s) in a ravine and dump burning oil on them. On a latecomer note, I don't really see how the Black Knight can be an echo of Ike. He may be faster than he looks in that armour, but he'd still look ridiculous flipping around during Aether... not that he has any access to that move. His style is markedly different, even if he may have trained under the same person as Ike. Put me down as a supporter. I've always liked casting magic spells and whatnot, so I would very much like a character that solely wields them. Well... While Micaiah herself would fit any Element except Fire... Yune would fit both Fire and Earth xD. I thought Yune would fit with wind because chaos represents freedom. So I think a wind blessed Micaiah would work. If I could have two new Fire Emblem characters of my choice to be in Smash, they would be Micaiah and Celica. If I could only choose one, it would be Celica. Does that qualify me as loyal enough for being a "supporter"? True, we don't see Yune giving much of a boost to Micaiah in terms of power. I mean, presumably Yune's blessing is a power boost of some stripe, at least, though? Yune does give Micaiah a boost in power. Micaiah's third tier promotion is caused due to being blessed by Yune. Here is what Yune has to say about Micaiah's power up. Yune blessed Micaiah is a one man army in terms of story. Also if anyone is interested in more Radiant Dawn characters in Heroes, please vote here for your top 4. I think Yune would fit any element that isn't Water based in that idea. Also; Micaiah last promotion should have been better (but I understand why didn't happen; in FE10, pretty much all the promotions are the same outside of Movement Increase in Mist's case). Yune's emotions caused the Tellius flood so maybe she fits water as well lol. I agree. I think RD didn't do a good enough job to differentiate units in the same class. Caps were only slightly different and promotions gains are pretty much the same. Growth rates being different didn't matter much because of BEXP to cap all your stats. OK, are we supporting Micaiah or Yune here? We can discuss power-up semantics and the extent of Yune's powers all we want, but in the end I don't see anything tangible enough for her to make for something interesting in gameplay. Here's a thought: what if Sacrifice was made into a taunt? On it's own it's just a glowy hand, but do it next to a teammate and you can heal them at the cost of your percent rising. I agree; all the mages have 30-33 Spd Cap, 36-38 Mag Cap and other very similar stuff in their other stats as their caps. I think the BEXP thing is an oversight more that anything xD. We're definitely supporting Micaiah; but in a discussion talking about her abilities; it's pretty likely someone ended up eventually talking about Yune's abilities. I personally think Yune only would play a role in a taunt and/or affecting Micaiah in some way while she is doing her Final Smash (the red eyes). Oh! I remember someone mentioned to me; but that was a long time ago; I feel a bit nostalgic remember it now... hehe. Sacrifice is definitely one of the most tricky abilities to implement from Micaiah's skill set. I feel like I'd be back on board with Micaiah. I felt like it'd been too long, but I really like the character, and who knows she could show up again in future fire emblem games. I'd love to see her in. You can add me as a supporter if you want. We posted here at the same time lol. Well, even in it's game of origin it's a gimmick at best. It's rather quickly replaced by staves, with it's only benefit over them being clearing status ailments, and those are pretty rare. Speaking of staves, which debuffing ones do you think could be used? I guess sleep is an obvious one, and maybe a warp staff for recovery? As you wish Teeb! 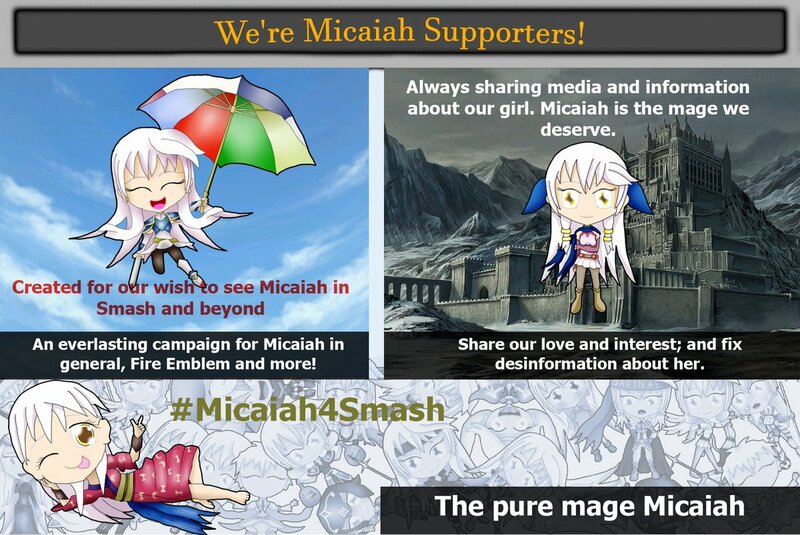 Welcome to the Micaiah Supporters! It would great to see her in future Fire Emblem games; but at least there is good odds to see her in future Spin-Offs. Sacrifice can ocasionally be useful; I think one of the most important moments it can be used if Micaiah is silence'd by the Final Boss omni-Silence attempt. Rewarp is definitely a good choice for Recovery, I have it in my Micaiah Moveset :3 ; I personally had thought about Silence, Sleep and Torch; mostly Sleep because is the most straightforward to implement. Then again, this would really only have use in Doubles, but... I still think it's fairly interesting. And it might need some tweaking for better balance, but that's the gist of it. I'd just use something like Fortify, with an area of effect around Micaiah, and bend the rules a little by allowing herself to be affected by it. Doubles-only might work for the Team Healer item, but absolutely not for a fighter. Same reason Sacrifice would be relegated to a taunt. Of course, enemies could be healed by the area effect too if they get too close, punishing reckless usage. Any kind of heal in a Fighting-Game should have some kind of downside. It could even be charged to upgrade to the Ashera staff, not only giving a big heal but also temporarily buffing stats or everyone near, though this would eat all durability instantly. Also thought it ould be neat if light tomes on neutral b would charge like Robin's, with each level being slower to take effect but stronger. But you can freely move after casting and while the spell is taking effect, making it an interesting trap. Oh yeah; that would be a neat effect; we don't usually have this kind of buffs as special moves. Yep; I agree that her Neutral B should have different projectiles with each charge level. It feels kind of weird calling them "projectiles" the way I imagine them, being more akin to delayed explosions. Only the uncharged version, Light, would ressemble that, albeit in a downward direction (it's also the only one to strike instantly)... and I guess Thani too. A more traditional projectile is how I see the debuff staff working. I'm used to use "Projectile" as the general term for anything that is throw; but get you're idea with explosions. Also yeah; Thani would be a downwards attack. How fast and big do you think should be the staff projectile? Fairly small, travels approximately 2/3rds of Final Destination at an average speed, but with a noticeable startup. Something that can potentially guarantee a smash for the KO can't be too easy to land after all. I liked how BEXP works in RD though because it allows you to strategize on whether you want to save it up to level up uncapped units or to cap weak stats later on. OT: I think Micaiah's staff utility can be her down B special. If an enemy is in range, they get put to sleep for 3 seconds or if an ally is in range, they get healed 20%. This move would have a decent amount of lag and will be slow. Up B can use the rewarp staff. Unless you have any suggestions for what would be her side special, I don't see why you can't split the harmful staff from the healing. Debuff staffs only target a single enemy in Fire Emblem, and depending on the game, at a distance dependent on your magic, whereas staves that can heal multiple allies exist. Unlike Robin, Micaiah doesn't have the advantage of magical diversity, so a single special input should really be all that's needed to cover the bases there. That reminds me; it wouldn't be the first time we see something that has different effects depending the circunstances. Against Allies always heals; against enemys has high chances of doing damage, and low chances of healing; (and against Team Attack allies it seems it applies the same logic but inversed). Yeah, but can you walk up to enemies with a staff and hurt them with it's healing functions? I think not. Not to mention the different staves have distinct designs that would not be beneath the notice of a man like Sakurai. What would happen to the staff if you had an enemy and ally in range at the same time? Oh; I wasn't imagine the situation like that... but yeah; in that kind of situation it would be weird xD. Someone is interested in voting in this little poll from Nintendo Poll? Follower Friday Poll: @HeroWatcher840 wants to know, what do you rate #Micaiah, from the #FireEmblem series, chance of becoming a newcomer in #SmashBrosUltimate? Follow @NintendoPoll for more #Nintendo and #SmashBros polls! Results RTed next day. What did you vote? I didn't vote but I think 1% is the best option. 33% is way too high of a chance, let alone the other options. The poll would be better if it had smaller percentage chances as options. Also, thanks for posting the Halloween Micaiah picture on your Twitter page. It is absolutely beautiful. 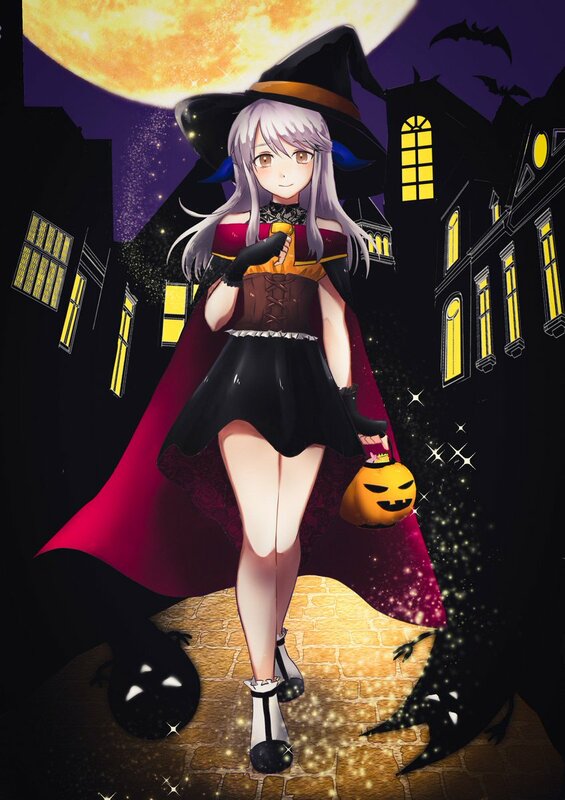 Maybe next year we can have a Halloween Witch Micaiah. Would be thematically fitting because she has silver hair, uses magic and is a morally dubious character. Another reason why I want this to happen is because using both Micaiahs is so much fun in arena assault and other content due to armour effectiveness, coupled with high attack, coupled with range. I also like how both Micaiahs also have different niches. Red Micaiah is a dancer to differentiate her. Now I hope for a flying green tome Micaiah with another Thani variant to give us more colour coverage and a new movement type. It will make arena assault and squad assault much easier because you have more options to annihilate beefy tanks. Now I'd be disappointed if this doesn't happen, but so far, IS has treated Micaiah very well in this game, at least as a unit, so I'm optimistic. I also want a colourless staff Micaiah with dual effectiveness. Imagine the despair when an armour emblem team encounters a full Micaiah team with lots of merges. Just thinking about this makes me want to whale for her if this happens in the future. A +10 Micaiah team will guarantee me 900 feathers every week because I don't see everyone being able to survive such an onslaught due to how arena scoring works making you want to use an armour emblem team to score the best. But hey, exploiting the arena scoring system to make a cheap defense team and taking advantage of your opponent's need for armours is something Micaiah would do, no? One problem with the Twitter Poll is only having 4 options; so they had to went with some close enough chances to define basic ideas about probability. Oh indeed; it would be very fun to have green and colorless Micaiahs with their respective Thani-like, it would be so fun! And yeah; I want more Micaiahs, I want to give Micaiah some money eventually! I didn't know Twitter only allowed four vote options. You learn something new every day. Inherit miracle on Micaiah. She has miraculous powers after all so maybe the 1% is possible. Have you seen videos with special spiral Micaiah? She's awesome especially if you have a team with a couple of infantry pulse users. What's your long term plan when it comes to building her? So I need two Lewyns, two Ishtars and two Brave Celicas. That's a huge investment but worth it for the two Micaiahs. I just searched up which units can survive my Micaiah with this build assuming she starts charged with glimmer, and the answer is not a whole lot. Even with Berkut's lance, distant defense and warding breath, there are only 43 units that can survive my particular +3 Micaiah. I just realized staff users can't fire off specials and are restricted from stuff like death blow. BTW, even Mangs is in love with the Witch Micaiah art. Please post your plans on this thread if you don't mind. I hadn't see videos with Special Spiral other of Ares with his Weapon and Lewyn. I'm thinking in doing many builds; but I would like to have a Death Blow 4 indeed. I think you can avoid using some Celica if you inherit the Death Blow 1 from other source. Here is one where Robin Abyssal LHB is done. That's impressive considering the massive stat inflation in Abyssal mode. Of course, I can sacrifice Hawkeye to get DB2 and then Celica for DB4 and astra in case I needed astra for some reason. I would like to help you if that's okay with you. I've been using both Micaiahs quite extensively in game modes like CC and TT where they both shine. I saw the promotional picture. That is ThanyTony's artstyle so you weren't lying when you said "we". I like how the group isn't solely dedicated to her being in Smash but in other spin off games as well. Making RD accessible would also help Micaiah's popularity. Fixing disinformation is also something that we have to work towards. Another misconception is that she has a bland personality but that's not true at all. Micaiah has a sarcastic side to her. As you can see, Micaiah is talking smack by asking a rhetorical question because it is well known that Begnion doesn't care about keeping the security. Zaitan: The Silver-Haired Maiden! I’ve got you! Lucky for you, Jarod wants you alive—but there’s no escaping now! Micaiah: I’m afraid I have to disappoint you. Zaitan: Oh, how pompous! Try to “disappoint” me, and I’ll break both your arms! This is obvious based on the fact Micaiah has no qualms in fighting these evil tyrants for survival. What makes this remark sarcastic is that Begnion always finds them so it is by no means a surprise hence the exaggerated claim of "surprise" being said twice. Micaiah's most famous and liked line. Exagerated praise to someone she doesn't like, not very different from some of the other lines but those aren't as famous because Ike and Sothe aren't brought up, let alone in a hilarious fashion. Micaiah: Making hostages of the helpless… Is that how knights of the great Begnion Empire operate? Laverton: Shut up, shut up, shut up! Saying great is obviously being sarcastic because there's nothing great about those scoundrels. I posted this to get a rough template in case I do a Micaiah personality analysis later on. Oh; that is quite impressive indeed! Special Spiral is a very cool skill! I don't mind DB4 existence; but I would like to see the normal DB3 to be more common now because of that xD. Oh yeah; this whole time Thanytony was helping me doing stuff for the page; most of his work has been the design of the Twitter Page, but he also did my signature and many Micaiah draws. We're happy to see more people appreciate Micaiah! Do you remember how you found the Tellius Games? Well, I found Radiant Dawn at Blockbuster while that was still open. Oh hell yeah ! My big brother and I owned a Game Cube back in the day and he always had a talent for choosing the best games; including Path of Radiance. For me, this game is the best ever when it comes to story telling. I really loved plenty of the characters ( Marcia the pegasus knight and Misty being my favorites back then ). Naturally, when Radiant Dawn came out, I bought it as soon as it was released. Another amazing game, full of memorable characters ( including Micaiah of course ). I played all the Fire Emblem since then ( GBA, DS, 3DS ) and none of them, although I loved them, gave me the same enthusiasm. Hopefully, the Switch game will blow me away with its story telling ! I would like to see more sources of fodder for these skills such as DB3 and desperation because so many units need them but the chance of getting specific fodder is low. Once you finish the article, I want to read it before you post it. Maybe I can add some details and make it even better. Did he finish reading my analysis? Voice acting would be nice. It did a lot for Echoes' characters. Nice to see another Tellius and Micaiah fan on board! If you want, you can read my analysis on her character. It is quite long and detailed. Spoiler alert. It's related to the Smash direct. Micaiah is in the game! As a spirit, which is basically a non playable fighter. Oh that would be nice indeed... For DB2 there are several choices in the 4 Star Characters (Klein, Hawkeye and Effie), but for DB3 you need Klein or promoting the other ones (at least Effie's alternative fodder is good for score). Okay! I'll show it to you when I have something done (I'm a bit in brainstorming right now after making the Micaiah4Smash Picture). I don't know, I'll ask him later. Now I wonder if Spirit essencially confirms character for DLC or not. Spending 20k feathers when you are unlucky with fodder is a bitter pill to swallow if you're too impatient. They need to do something about FEH skill pool because right now it is too dependent on the RNG. It doesn't help most of the characters are junk to roll. Talk about how cute her design is and how it suits her character. Of course you will. Just like how you were going to post my Kurthnaga character analysis. King K. Rool is both a spirit and a fighter so it doesn't. Would you prefer she was an assist trophy instead even if it meant she would be completely deconfirmed? The fact she was explicitly shown for more than a couple of seconds unlike the other spirits gives me hope because it goes to show that she's more popular than the other spirits considering she was given screen time over hundreds of options. But I don't understand how she's different from the other spirits when it comes to unlocking. Is she also a legendary spirit? I think most of the characters are decent for fodder; but are overshadow (I think there are few characters that are actually bad fodder like Raigh that his best to give is his weapon). Oh? That is a quite strange topic to talk about; I'll need to think how to do it xD. He's actually very close to the end; he was a bit busy; but he'll comment you something in Reddit soon; and about Kurth... Okay; I'll read it this weekend Ice xD. I sense a bit of passive-aggresive attitude here, Are you roleplaying Micaiah now? Oh indeed!, Spirits are not dead... that sounds weird, but it's true xD.